One for you and one for me (a give away!) - Stop staring and start sewing! 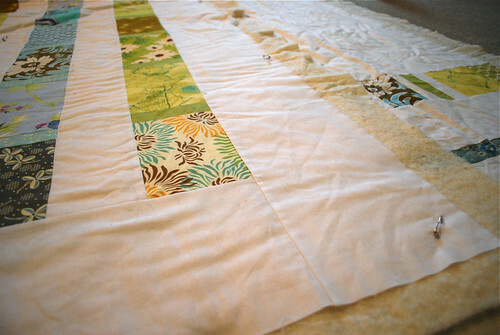 I'm finally back to working on my quilt and just got it basted. I'm used a combination of spray basting with a few pins in it just in case. We'll see how it goes. This one is taking longer than the last one partially because of all the interruptions my life has right now and partly because I can tell I'm not as crazy about this one as the last one. I like it and I love the pattern but I definitely like the fabric combination on the other one better. Don't look too close. My cats have been sleeping on it and wrestling under it and it's pretty hairy right now. Ugh. 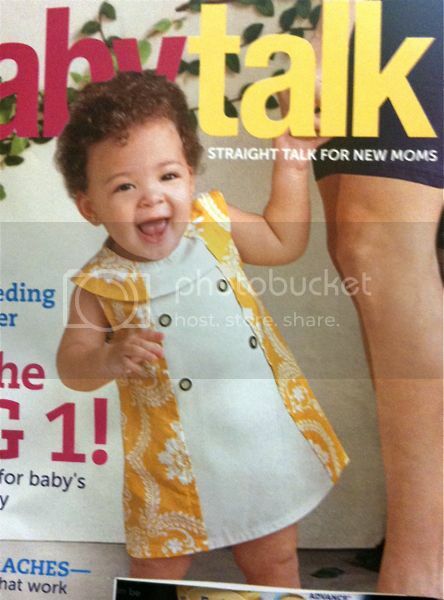 I took two kids to the doctor this week and almost squealed when I saw this magazine with this gorgeous little dress on it. That's one of my favorite prints from Jennifer Paganelli's Bell Bottom collection. I learned after the first kid that buying a dress with white down the front was a recipe for disaster (and lots of stain remover) but it's a cute dress and I tracked down the manufacturer here to see what else they had (more cute stuff!). The UPS and FedEx trucks have paid us a lot of visits this week as the kids school books start rolling in. I was shocked when it turned out one of the packages was for me. 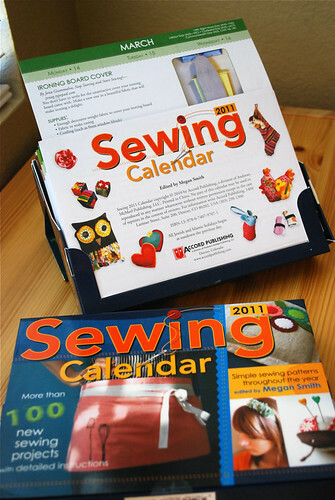 Last year Megan at Accord Publishing asked permission to use my ironing board cover tutorial in the 2011 Sewing Calendar and here it is! There are more than 100 projects from various crafty blogs in it and it's really nicely put together. I was so happy they sent me two copies (especially since I wasn't even expecting one at all) and I knew the other one would be a very nice give away. So just leave a comment and I'll use random.org's site to pick a winner. If you don't win be sure to check your local bookstore for this calendar (I got last year's calendar at Costco!). Keep on sewing and enjoy your weekend (one week until school starts for us)!